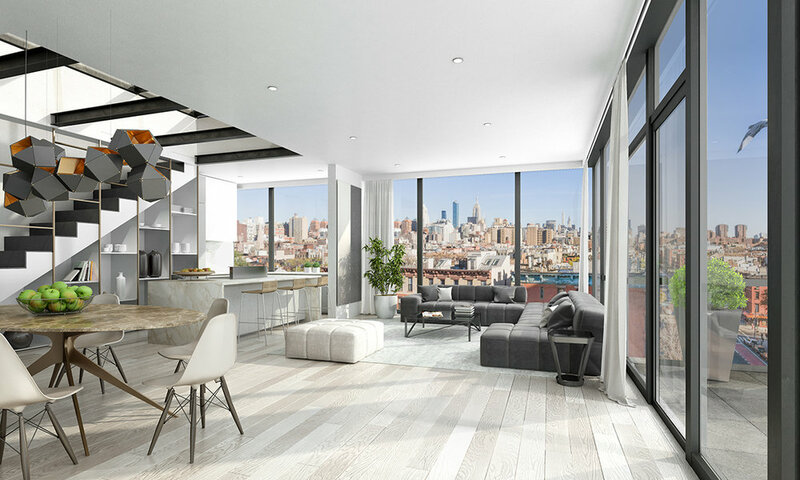 A new architectural masterpiece situated at the heart of the East Village, and at the convergence of the Bowery and Lower East Side, 75 First Ave features homes of unsurpassed luxury and style. Cantilevered over the corner of East 5th and First Avenue, this timeless glass tower is the result of the passions and extreme skills between renowned developer, Colonnade Group, the acclaimed HTO Architects and prominent Italian designer, Stefano Pasqualetti. The building lobby boasts a fumed glass door entrance, lava stone floors and walls, and a contrasting yellow travertine stone desk. Black stucco adorns the elevator walls, while the private residents lounge features a yellow travertine stone fireplace, white stucco walls with brass reveals, a pool table, and several areas of seating. Additional amenities include a full-time doorman, a landscaped rooftop, a fitness center, and bicycle storage. Available units include 1 and 3-bedroom homes with several 1-bedrooms featuring sizeable home offices, and a dazzling selection of Penthouse residences crown the building. 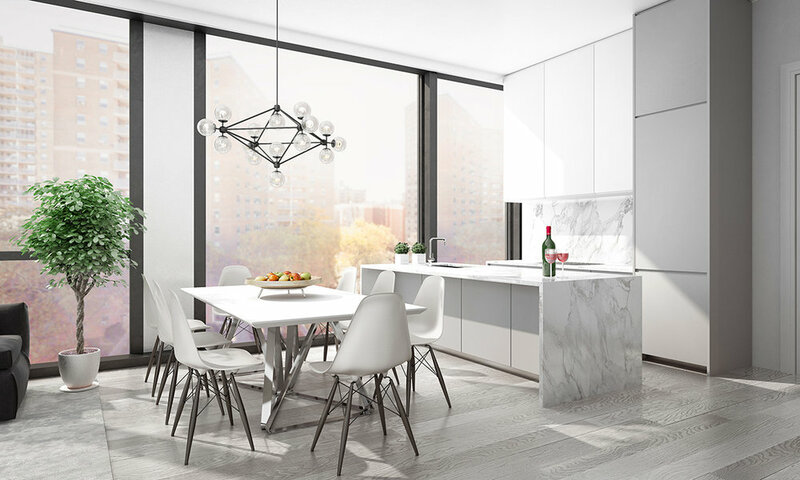 Each home of 75 First Ave blends a modern open layout with sleek finishes, Italian doors and hardware by Lualdi, and gorgeous floor-to-ceiling windows. Kitchens are equipped with white and greige matte lacquered cabinets custom made in Italy by Arclinea, white Carrara marble countertops and backsplash, Fantini faucets, and top-of-the-line Miele appliances. Bathrooms are adorned with custom sinks and vanities, and Piasentina stone flooring. 75 First Ave is only a few blocks away from the excitement of the Bowery and the hustle of SoHo. It is surrounded by an eclectic mix of restaurants, bars, cafes, theaters, shops, and grocery stores. Nearby subway lines include the F and 6. Blending the history of the past with the eclectic tastes of the present, the neighborhood known as the East Village—covering the area east of 4th Avenue to the East River, and between 14th Street and Houston remains a bastion of New York City energy and excitement. Locales like St. Marks have become popular social domains, and First Avenue, once a transit corridor and nothing more, is now recognized with a number of restaurants, cafes, and bars. In fact, because of its central location, First Avenue has become a desirable destination to enjoy all aspects of the neighborhood. Lining the Avenue are trendy restaurants like Momofuku Noodle Bar, Upstate, and Frankie’s. Lounges like The Bowery Hotel, Death & CO, Joe’s Pub and don’t forget your Big Gay Ice Cream Shop are just a few of the hot new spots! Yet, with all this change, neighborhood mainstays like Veniero’s, an Italian bakery whose origins stretch back over 120 years, and Veselka, a veteran from the 1950s and one of several authentic Ukranian establishments in the area still shine through. The East Village has become a home to people of all backgrounds, lifestyles, and stages of life. It’s countless number of activities, eateries, and shops continue to be a draw for city novices and veterans alike. Subway lines with stations within the East Village include the 6/L/F/M. Stefano Pasqualetti is an Italian architect with a design vision inspired by craftsmanship, materials, lightness, and transparency. Sponsor reserves the right to make changes in accordance with the terms of the offering plan. The complete offering terms are in an offering planavailable from Sponsor. File No. CD16-0303. Sponsor: 75 First Ave Club LLC,. Located at 350 5th Avenue, 41st Floor New York, NY 10019.